The Crazy Bookworm: Author Spotlight with Jennifer Brown and Giveaway! Author Spotlight with Jennifer Brown and Giveaway! 1) I love anything and everything Disney. I even have the Cinderella castle tattooed on the inside of my wrist and Mickey Mouse ears tattooed on my shoulder. 2) Even though I am terrified of heights, I once mountain biked with my husband down Pike's Peak. 3) I'm a great cook, but I can't bake to save my life. 4) Before becoming a writer, I worked in food service, child care, and Human Resources. 5) In college, I took Self-Hypnosis and Biofeedback, Medical Ethics, and Drawing and Painting, but I never took a single college writing class. 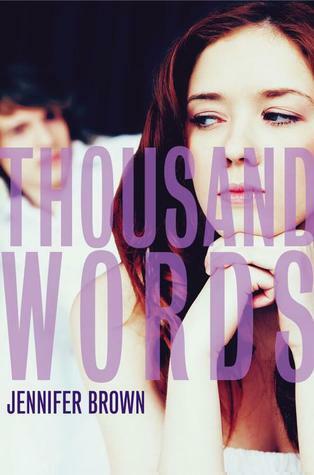 Your newest novel Thousand Words tackles "Sexting" Your novels are always so raw and powerful; School shootings, abusive relationships. What inspires you to write about these stronger subjects? I went through a lot of raw stuff as a kid and teen, so I think some of it is just that I have an interest in raw stories, and my voice lends itself naturally to them. But I also enjoy writing these books, because I think tough subjects are important to write about. Books that explore difficult subjects can open a discussion, and I fully believe discussion is the first step toward solution. The more we talk, the more we learn, the more we can prevent! What message are you hoping Young Adults receive from your novels? Well, each novel comes with its own message, but I suppose they all boil down to one central message, which is to try to understand one another, try to accept one another, and try to love one another for who we are. The idea for the story comes first, but with very sketchy details, and I'm totally okay with that. I spend much more time in the beginning phase developing my characters than I do developing my plots. Before I even begin to worry about refining plot points, I write long character sketches on each of my characters. I want to know everything about them. I like to get to know them as real people before I begin dismantling their lives. What is 'A Day in the Life of Jennifer Brown' like? Every day is different. Sometimes I'm writing YA. Sometimes I'm writing middle grade or women's fiction. Sometimes I'm revising or working on copyedits. Sometimes I'm traveling and speaking at schools or libraries or am attending conferences. Sometimes I'm answering emails or letters from readers. Sometimes I'm working on my websites or catching up on social media or whatever. The unpredictable schedule is one of the things I love most about being a writer. Keeps me from getting bored. But generally I'm on mom duty until late morning, and then I work until late afternoon, when I'm on mom duty again. And then there are snow days and spring break and summer break and sick days and other times when I'm on mom duty all day long and have to wait until late at night or very early in the morning to get any work done. Flexibility is key with writing, as it is for anyone who works from home. My favorite place to write is my kitchen table, because it's convenient and I'm surrounded by windows. But my most productive writing takes place in my office. I like to write to music, but it has to be music with no words, or music sung in a foreign language that I don't understand. Dinner Party! You can invite any 5 people to dinner(Dead or alive, real or fiction) who would be on your guest list? If there was a well-done screen adaptation of one of my novels, I would love it! But I don't write with, "How will this look in a movie?" in my mind. I'm terrible at the actor/actress game, but will admit that I would love to see what Lucy Hale could do with Valerie from HATE LIST. She has such amazingly expressive eyes. ...my kids and my husband. They mean everything to me. I am working on a lot of things now! I have a women's fiction novel, THE SISTER SEASON, coming out in November, and am currently working on a middle grade that will come out in 2014. I just finished revisions on TORN AWAY, my next YA novel about a girl who loses everything in a tornado, which will come out May 2014. And I have a very exciting secret project I'm working on, too. Right now I'm reading THE OCEAN AT THE END OF THE LANE by Neil Gaiman. Ummm EVERY ice cream flavor! Okay, okay, pistachio wins. I am a total foodie. So....fooooood! Jennifer was so kind and awesome enough to offer up not one but TWO copies of her newest novel Thousand Words. You can read my review HERE. * Giveaway ends Monday, August 5th. Fantastic interview Cathy! I loved The Hate List and am looking forward to reading Thousand Words. I agree with the author that books about difficult topics create opportunities for discussion, and discussion creates opportunities for solutions. BTW That is a GREAT idea for a Pinterest board! Jennifer is my hero--she writes about difficult topics without flinching. If you get a chance to hear her speak, GO! She's is 100% genuine. I loved "Hate List" and am excited to read "Thousand Words".